Although some Starfleet officers Data has served with, such as DR KATHERINE PULASKI, consider him to be a machine, little different to a sophisticated tricorder, many of Data`s crewmates hold a very different view. Most consider him to be a valued friend, in the same way that they would think of an alien from another species as their equal. Data`s most enduring friendship on the U.S.S. Enterprise NCC-1701-D is with Geordi La Forge. Although La Forge is an expert with machinery, he experiences difficulties in establishing relationships with people. These personality traits may explain why he so easily maintains a friendship with Data, a sentient machine. Another of the androids close friends on the Enterprise, the Klingom WORF, also has difficulty understanding humans, particularly when it comes to humour. Both Worf and Geordi find Data, who shares their problems, easy to relate to. 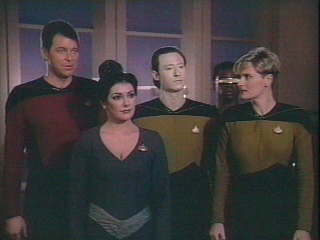 Other officers who have less trouble making friends are also honoured to count Data among that number, CHIEF MILES O`BRIEN and KEIKO ISHIKAWA ask him to play an important role in their wedding ceremony, an event which Data uses to illustrate his understanding of human friendships in a report to Bruce Maddox of the Daystrom Institute`s cybernetics division. Data`s most personal involvement with a fellow officer takes place in 2364, when a variant of the PSI 2000 virus infects the crew of the Enterprise. Data`s biological systems render him susceptible to the virus. He experiences it`s inhibition-suppressing effects when he visits the quarters of the Enterprise`s Chief of Security TASHA YAR, Yar, who is also affected by the virus, confesses her need for physical contact and companionship. Under oath in a subsequent legal hearing at STARBASE 73, Data confirms that he and Yar had "been intimate". After the effects of the virus are reversed, Yar is embarrassed by her behavior and bluntly tells him, "it didn`t happen." However, their strong involvement makes a strong impression on Data. After Yar`s death, a holographic portrait of her becomes one of his most prized possesions. Three years later, Data becomes involved with another fellow officer Lieutenant JENNA D`SORA. Data is interested in expanding his knowledge of emotional interactions, and so decides to responds to D`Sora`s apparent romantic interest in him. However D`Sora has just ended her relationship with another member of the crew JEFF ARTON, and soon realizes she has replaced one unemotional partner with another. D`Sora thus withdraws from her pursuit of Data - a decision which, predicably, has no emotional effect on the inquisitive android. Data`s next romantic liaison almost ends in tragedy. During the U.S.S. Enterprise NCC-1701-E`s mission into the past, he is captured by the BORG, and the BORG QUEEN intends him to become her mate. The Queen offers Data the experience of sexual pleasure for the first time in more than eight years, but this is not enough to make him betray his friends, especially not when Captain Picard has risked his life to rescue him. Data`s sense of duty and regards for his friend`s well-being ensure that he is able to resist the temptation offered by the Borg Queen. That Captain Picard is prepared to risk so much in order to rescue Data also illustrates that his colleagues aboard the Enterprise have certainly come to regard him as much more than a mere machine. There are times, however, when Data`s machine nature can be a distinct advantage. As an android, he lacks the ability to grow bored, and is therefore the ideal person to engage in inane small talk with the less interesting guests, such as COMMANDER CALVIN HUDSON, at diplomatic functions. Data`s friends have undoubtedly formed an attatchment to him which is more than the sentiment they would feel towards a piece of equipment, no matter how useful ir had proved in the past, as time goes on, such attachments can only grow stronger. As Data learns more about the humans and other organic races with whom he serves, he will grow to understand them better, especially with the addition of his new emotion chip. Until then, his childlike innocence and inquisitive charm appear to be enough to carry him through.